We use a similar script to export on either file category, extension or signature. I assume you deal with duplicate content by amending the file name. Currently we change the names of all files to consecutive numbers, this also addresses arabic script we sometimes come across. 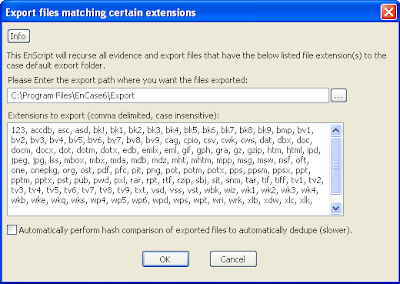 The EnScript creates a list of either filetypes, categories, extension from which certian types can be excluded. It can be set to ignore knows or unselected files. Is it possible to get a EnCase 7 version of this script?